The series that revolutionised the gaming world with a new genre of gaming called “survival horror” has received a next-generation console facelift that moves the genre to a different level. The story once again revolves around the scientific facility of Raccoon City that through its nefarious experiments, endorsed by its company called “Umbrella” created a deadly virus that changed humans into zombie like creatures. In this current installment, gamers follow Chris Redfield, a former security personal of Raccoon City who is now a member of the B.S.S.A. The mission of the B.S.S.A. is to investigate any outbreaks of the virus or creatures from Raccoon City and eliminate any threats towards humanity. Unfortunately, one of the creations from Raccoon City has found its way to a terrorist cell which threatens the very fabric of reality. Thankfully, Redfield has been given a lead that a local weapons dealer in the fictitious African nation of Kijuju is about to sell this doomsday creation to a nefarious individual. Joined by Sheva Alomar, a local B.S.A.A. agent of Kijuju, together they must put aside their differences and embark on a deadly journey of ensuring that this threat is terminated. Unfortunately for them, there is an almost endless horde of strange creatures and mutated humans in their path. 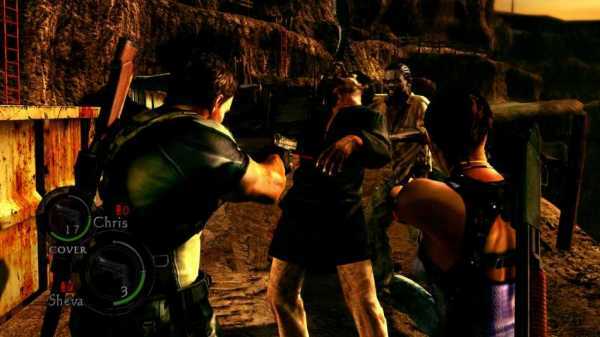 Although the gameplay is quite reminiscent of Resident Evil 4 in this third person, over the shoulder camera angle, the limitations of the previous game are also present in this current version. 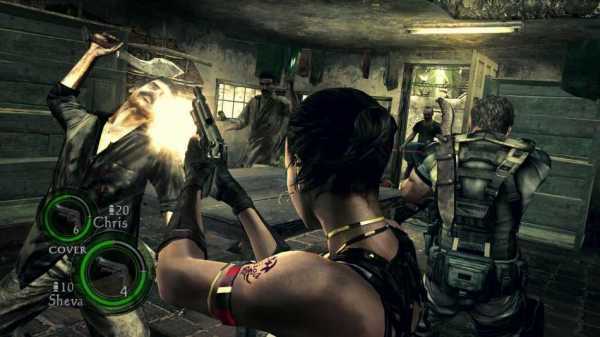 Unlike game such as Tomb Raider or first person shooters, Resident Evil 5 is quite a slow paced game, that is, in terms of movement and engaging in combat. It's not to say that the gameplay is bad, far from it, it just means don't expect action at every corner of the world you play. Think slow and methodological. You have access to a plethora of entertaining weapons, however in order to shoot your gun, you need to come to a standstill. This can be quite tricky at the best of times, especially when a horde of zombies are attempting to kill you. 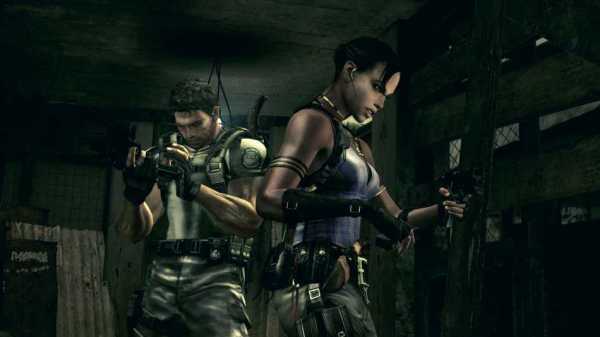 Thankfully you have a partner in crime called Sheva. The best part of the gameplay is the introduction of a workable character that must be used in conjunction with your main character to successfully complete the game and I must commend CAPCOM for making the AI of the game quite realistic at times. The introduction of a workable non-player character must also be used when you are battling bosses or attempting to access other areas of the game. 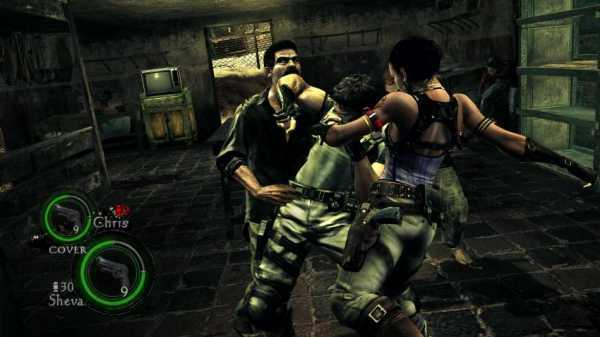 The game also supports an in-depth split screen mode or you can play cooperatively through XBox Live, however if you don’t, Sheva is easily one of the most realistic AI team mates that I have had the pleasure of playing with. There is also an online leader board which records scores. The fiddle some inventory system of the Resident Evil series has received a much needed face lift that is oozing with modern gaming. Players can only store up to 9 items which can easily be accessed via the D-Pad on the Microsoft 360 controller. Another twist is that the game no longer pauses when you access your inventory, which really adds to the adrenaline pumping nature of the survival horror genre. Even better, you can trade items with your partner which is great and in turn, allows for up to 18 items between you both. In terms of gameplay, the creators of Resident Evil have successfully managed to once again all the elements of the survival horror genre as you are always playing the game on edge because you don’t know what’s around the corner or if you have enough ammunition. The cutscenes flawless meld with the in-game graphics that also adds to the experience. The combat in the game is great and you are often saving your ammunition due to the nature of the game and thankfully the AI player also walks this path too. Match that with a variety of boss battles throughout the game and this is one game that will have your heart rate pulsing. Throw in some unlockable items in the game and also points that can be used to purchase characters, costumes ammunition and the like and this gives you some personal objectives to reach. 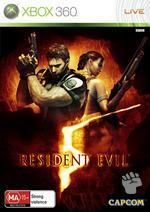 Graphically, Resident Evil 5 is pure eye candy that simply looks stunning on the XBox 360. The characters are extremely well animated and contain some very realistic texture who move with a human-like grace. The facial expressions are thoroughly realistic. Match that with some great in-game cutscenes which not only help progress the story but also the sense of urgency and you have a very well made game. The attention to detail at times is breathtaking. Add in a very cool and ambient soundtrack with some over the top voice acting (a standard for CAPCOM) and some great sound effects which need to be heard through a surround sound system and Resident Evil 5 is a visually and very good sounding game. In conclusion, Resident Evil 5 may have slightly moved away from the original premise of the game but it’s good to see the developers try a different path for this series. Most gamers should complete this title in around 10 – 15 hours, however the game still offers some great replay value as there is quite a large amount of things to see and do in the game which you probably missed the first time around. It may not be the fastest game on the market, however in terms of story, presentation and fun, Resident Evil 5 does quite well.